Patrick Walters (left) and Miles Burghoff have yet to miss a money cut this season as rookies and both find themselves atop the points standings of their respective leagues. Miles Burghoff and Patrick Walters have never met. But if they were to sit down for breakfast at a Waffle House somewhere in the Southeast, chances are they�d have plenty to talk about. Both are former college anglers and made their way through the triple-A ranks to get to where they�re at today. 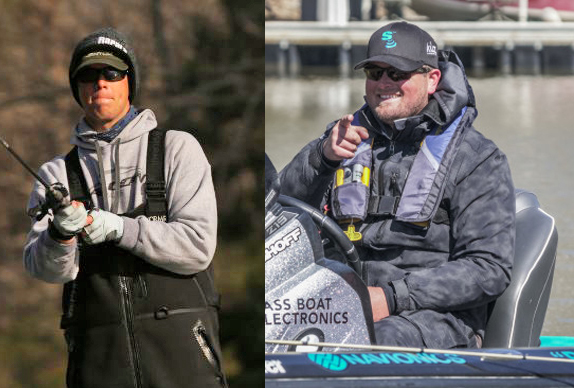 While it�s not even May 1 yet and there�s plenty of fishing left to do in the FLW Tour and Bassmaster Elite Series seasons, Burghoff and Walters, both rookies on their respective trails, find themselves in positions neither imagined being in just a few months ago. After five Tour events, Burghoff is leading the FLW Tour Angler of the Year standings by 17 points. Walters, meanwhile, is tied for the AOY points lead on the Elite Series side with veteran Scott Canterbury with four of the nine tournaments in the books. The only rookie to win the FLW Tour AOY title was Shin Fukae in 2004. It�s been 19 years since Tim Horton won the AOY title as a rookie in B.A.S.S.�s top circuit. They�re not alone, either. Drew Cook is currently fourth in the Elite Series AOY race while three other rookies � Tyler Woolcott, Dakota Ebare and Jon Englund � find themselves in the top 25 in the FLW Tour points. Burghoff says his success � five top-50s, including three top-30 cuts � has been a result of his preparation synergizing with a more in-the-moment tournament approach. In five tournaments this season, Burghoff has yet to finish outside the top 50. 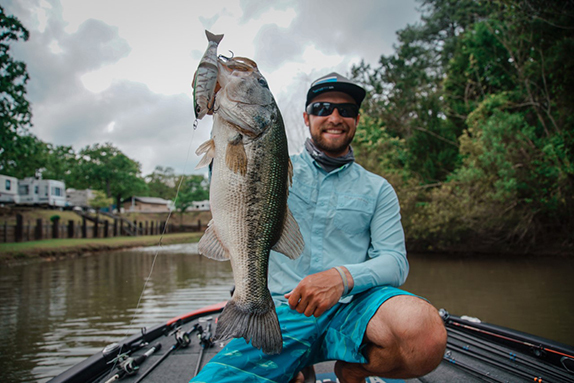 The key to his consistency so far, he says, dates back to a triple-digit finish at the Lake Toho Eastern Open in January 2018. Burghoff has extensive experience at the Kissimmee Chain of Lakes, having attended the University of Central Florida, but all that history deceived him during the event and he wound up 111th. It was a harsh learning experience, but he came out the other side less inclined to follow preconceived notions. He finished off the Eastern Open schedule with three straight top-40 finishes. �I was finally able to shake loose from the ball and chain of history and followed my gut,� Burghoff said. He�s carried that over to his rookie year on the FLW Tour, which included a return trip to the Kissimmee Chain in February. This time, he opened with a 10-13 limit, then tacked on 18-07 on day 2 and finished 36th, missing the top-30 cut by 10 ounces. 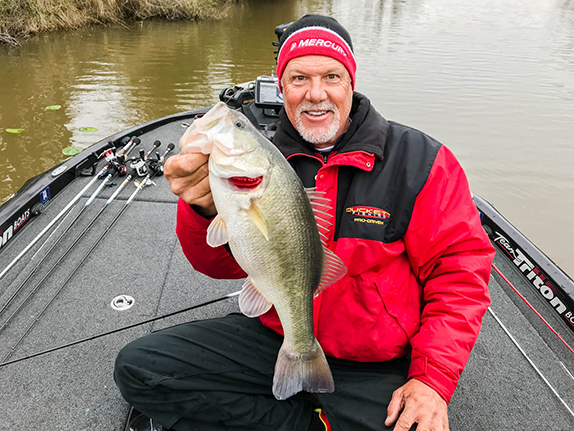 Coming off 11th- and 7th-place showings at Lake Hartwell and Winyah Bay, respectively, in his home state of South Carolina, Walters says this season has blown his expectations out of the water. He went into the season opener at the St. Johns River thinking it would be a shell-bed tournament based on his two previous events there while in college, but wound up finishing 4th by targeting spawning fish. He�d never been to Lake Lanier, the second stop, but he has a good grip on herring lakes based on his experience at Lake Murray and Hartwell. He carded a 22nd-place finish there. With the first four Elite Series events taking place as part of back-to-backs, Walters had plenty of time in between to be on the water and stay sharp. He thinks that�s been a major contributor to his consistency so far. Over the past few years, Burghoff has competed at various levels. From college to BFL to triple-A FLW Series and Bassmaster Opens, he�s seen plenty of scenarios at a lot of lakes he was previously unfamiliar with. He did it all on purpose with an eye toward the future. �I did that specifically to be uncomfortable and forced myself into uncomfortable situations that I have to dig out of,� he said. He said he�s tried to not focus on where he sits in the points standings. Barring a massive meltdown at Lake Chickamauga and Lake Champlain, he�ll be among the field for the Forrest Wood Cup at Lake Hamilton in August. For now, his focus remains on Chickamauga, which hosts the next FLW Tour May 2-5. While some may point to him as a potential local favorite in the event � he now resides in Hixson, Tenn. � he�s quick to point out he�s spent a total of three days fishing the lake this year. With five regular-season Elite Series derbies left followed by the AOY tournament, Walters knows there�s a long road ahead in his AOY title quest. That�s why he�s trying to maintain a short-term focus and not get caught up in any big-picture scenarios just yet. �I put the same amount of pressure on myself every day from day 1,� Walters said. �I do put a lot of pressure on myself to catch them because you have to. We�re early and there�s a lot of fishing left. The points are going to change a good bit, so that doesn�t mean anything leading right now. What matters is who�s leading after the next five.